This table service conveys a feel of countryside while remaining simple and elegant. British architect David Chipperfield has chosen simple forms and natural colours. “Tonale” represents clean lines and cool vernacular ceramics of Korea, Japan and China origin. The gentle, light colour tones of the porcelain were inspired by the colour palette the Italian painter Giorgio Morandi used in his still life paintings. “Tonale” is comprised of a variety of pieces: trays, carafes, plates, knifes of different sizes, glasses and cups, which are made of ceramics, metal, glass or wood. An elegant combination of materials and colours, a wide range of possible compositions. Perfectly adapted to meet modern requirements – all ceramic items are suitable for traditional ovens and microwaves. 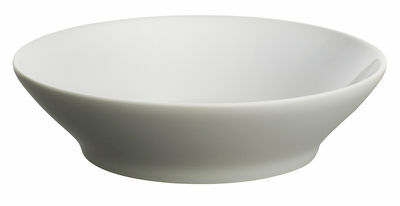 This ceramic bowl (Ø 18.5 x H 5 cm) is white on the inner side and grey on the outside. Looks great with other items of Tonale collection. Can be used for soups or starters. Also available in white.